Roderick, a Redguard knight, is a warlord residing in Fort Sutch, northeast of Anvil past Lord Drad's Estate. He has recently become ill and lies in an eternal slumber, while his loyal mercenaries, Gerard Melie, Laenafil, Neesha and Ulmug gro-Cromgog, keep him alive with a daily administration of a powerful medicine. Guarded by his faithful legion, the near-dying Roderick is unaware that someone has hired the Dark Brotherhood to help him along on his journey and will take advantage of his vital medicine to kill him once and for all. 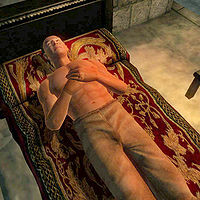 He can be found in the northern part of the fort, unconsciously fighting for his life in his bed with Neesha by his side. He wears nothing but a pair of tan linens and carries a small amount of gold. Although he can never use them, Roderick possess three leveled spells: two destruction and one restoration. Roderick himself will not react when approached, but you will receive the following message: "Roderick's skin is pale and covered in a sheen of sweat. It's obvious he's struggling for his life against whatever illness has claimed him." When Ocheeva hands you the contract, she will inform you: "Nestled in the mountains to the west lies Fort Sutch. It is the home of the warlord Roderick and his mercenaries. Roderick has recently taken ill. He now lies in eternal slumber, kept alive only by the daily administration of a powerful medicine. You must infiltrate Fort Sutch, find Roderick's medicine, and replace it with a poisoned bottle I will provide. But you must remain undetected! Whomever arranged this contract wants it to look like Roderick died from his illness, so discretion is essential." She will then add: "Roderick may lie near death, but dead he is not. Until his soul has passed, our client -- and Sithis -- will not be satisfied." and "It's uncertain exactly what illness Roderick has contracted. But don't worry, it's probably not contagious. He he he he he." After you have entered Fort Sutch and reached the large central room, you will overhear a conversation between Ulmug gro-Cromgog and Neesha, which will reveal quite a bit about Roderick and the dedication and loyalty of the mercenaries. Bad Medicine: Cure the sickly warlord Roderick at Fort Sutch: a spoonful of sugar, a pint of poison. Roderick doesn't take his medicine immediately; he only dies when the player starts the Permanent Retirement quest. Esta página foi modificada pela última vez à(s) 09h36min de 1 de setembro de 2011.